The first pick for Toys are Tools is not a toy! Sorry, but I had to do it because it is just so cute. 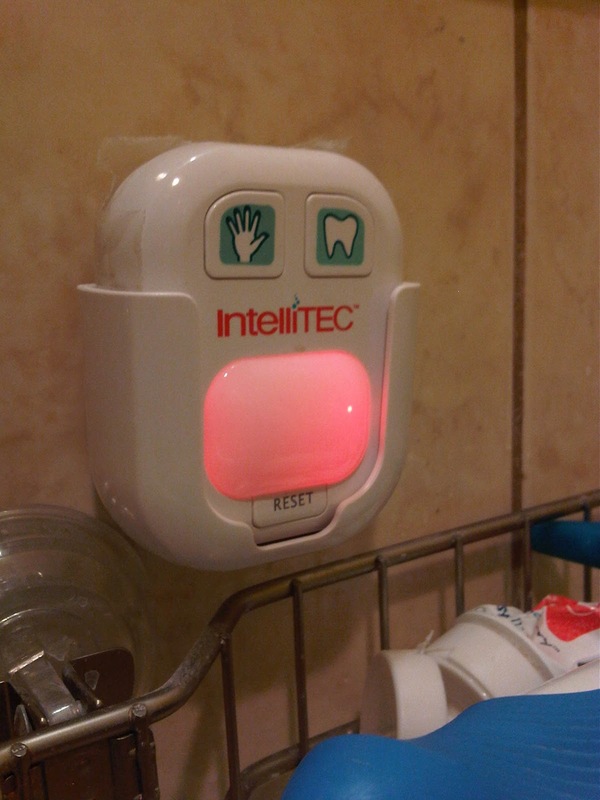 It's a timer which is designed to promote good handwashing and teethbrushing skills of a child. I love it because it promotes independence, good hygiene, and it is very affordable. This timer is so cool. (Click on the link to see a video) There are no words, no numbers, no sounds, only a couple of buttons and flashing lights. Even a toddler should be able to use this but it pretty much would work for just about anyone who needs to be reminded to wash their hands and brush their teeth for the correct amount of time. I also love the cost which is usually around 7 dollars only! Egg timers cost about the same price but they are not as appealing to kids and they can wake others up in the morning. I hate standing over my kids to make sure they do the right thing only because I have to do this ALL THE TIME. But this little timer can help me avoid some voice-related stress. That is, every time I am barking an order, I find that I end up with a shorter fuse by the middle of the day. Especially if that order is the same order that I say multiple times a day. I much rather say, "Hey, it's time to brush your teeth. Press the timer." Instead of "Go back in there and do it again. You can't brush your teeth for only five seconds!" How it works: You can velcro it or suction cup it against the wall where your children brush their teeth and wash their hands. You press the button you need and the green light will start blinking and your child will start brushing or washing. As you reach the end (20 seconds for hands; 2 minutes for teeth), the green lights will start to blink faster. This caused Number 2 a bit of anxiety but he got used to it. When you are done, the light will turn red and turn off on automatically. You press reset if you need to start over while the lights are still blinking. It's just so simple. A word of caution: you do have to make sure that they know how to brush appropriately if you let them do it by themselves. I have firsthand experience in this mistake. To be sure, it is useful when you use it to help you but not replace you. Ergo sum, it's a "family fix-it." In fact, for those brush haters, parents will be happy to know that the timer comes off its holder easily and so your child can hold it while you are brushing his teeth. This can give the child a greater feeling of control in this anxiety-producing situation. The lights are a nice distraction too. If you are staring at the picture wondering if that is tape on the back of the timer, then you are right. That was my own addition. The battery cover stays on just fine but I do not want my timer to get wet. They aren't waterproof. I ruined one already but I felt like it was still worth it to buy another one because this is a very important habit to teach and teach again. Believe me, the taping up part did help. (I used clear packing tape) My kids got it wet again and somehow, with the tape, it managed to survive another date with water. I am still looking for a visual diagram to show my kids how to correctly brush their teeth on their own. If you come across one, post it in the comments section, please!!!! with my speedy handwasher and tooth brusher not heeding the length of our songs anymore, I may need something like this.